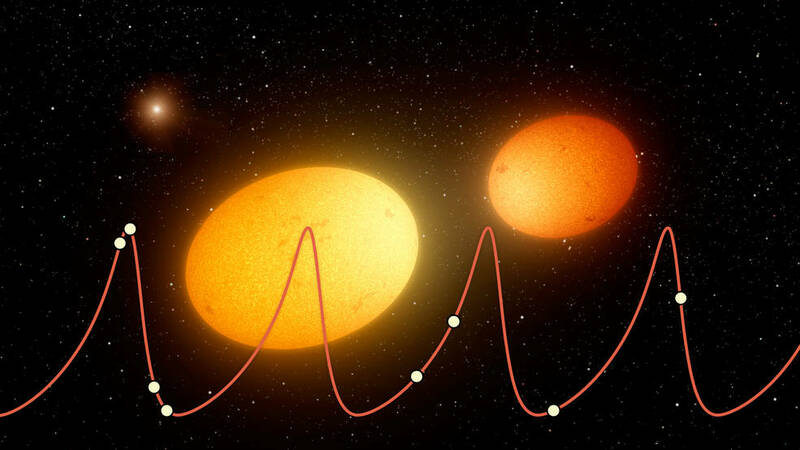 October 21, 2016 – Heartbeat stars, discovered in large numbers by NASA’s Kepler space telescope, are binary stars (systems of two stars orbiting each other) that got their name because if you were to map out their brightness over time, the result would look like an electrocardiogram, a graph of the electrical activity of the heart. Scientists are interested in them because they are binary systems in elongated elliptical orbits. This makes them natural laboratories for studying the gravitational effects of stars on each other. At the point of their closest encounter, the stars’ mutual gravitational pull causes them to become slightly ellipsoidal in shape, which is one of the reasons their light is so variable. This is the same type of “tidal force” that causes ocean tides on Earth. By studying heartbeat stars, astronomers can gain a better understanding of how this phenomenon works for different kinds of stars. Tidal forces also cause heartbeat stars to vibrate or “ring” — in other words, the diameters of the stars rapidly fluctuate as they orbit each other. This effect is most noticeable at the point of closest approach. Kepler, now in its K2 Mission, discovered large numbers of heartbeat stars just in the last several years. A 2011 study discussed a star called KOI-54 that shows an increase in brightness every 41.8 days. In 2012, a subsequent study characterized 17 additional objects in the Kepler data and dubbed them “heartbeat stars.” To characterize these unique systems, further data and research were required. Shporer’s study, published in the Astrophysical Journal, measured the orbits of 19 heartbeat star systems — the largest batch ever characterized in a single study. The authors followed up on known heartbeat stars, previously identified by the Kepler mission. Specifically, they used an instrument on the W.M. Keck Observatory telescope in Hawaii called the High Resolution Echelle Spectrometer (HIRES), which measures the wavelengths of incoming light, which are stretched out when a star is moving away from us and shorter in motion toward us. This information allows astronomers to calculate the speed of the objects along the line of sight, and measure the shape of the orbit. “We look forward to continued collaboration between ground and space observatories to better understand the complex inner workings of heartbeat stars,” Shporer said. NASA Ames manages the Kepler and K2 missions for NASA’s Science Mission Directorate. JPL managed Kepler mission development. Ball Aerospace & Technologies Corporation operates the flight system with support from the Laboratory for Atmospheric and Space Physics at the University of Colorado in Boulder. Work on this study was performed in part under contract with JPL funded by NASA through the Sagan Fellowship Program executed by the NASA Exoplanet Science Institute.